Commercial and private aircraft are marvels of modern engineering, but typically they are fuel-guzzling beasts. As the world moves toward a future of alternative energy and alternative fuels, many are hoping to give the airplane a green makeover. Some are focusing on biofuel-powered aircraft. Others are focusing on using alternative energy, chiefly solar power to power passenger aircraft. Solar power has already been used to power unmanned aircraft, but the challenge of hauling a heavy human up into the atmosphere remains more daunting. Enter Bertrand Piccard. Mr. Piccard, a distinguished Swiss adventurer will captain a new solar one-person aircraft designed by alternative energy engineering firm Solar Impulse. 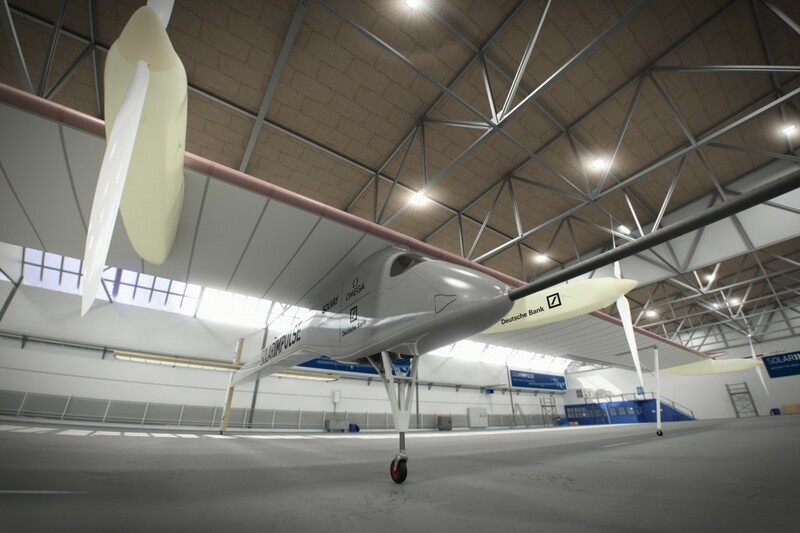 The aircraft’s wingspan is as wide as a jumbo jet (to provide maximum solar panel space), but thanks to space-age carbon-fiber materials only weighs as much as a mid-sized car — about 1,500 kg (the same as a Toyota Camry). There have been a handful of past solar aircraft, but most have relied on first storing energy in batteries, then flying (one example is the Sunseeker from the 1990s). The HB-SIA, as the new aircraft is called gets enough charge directly from the panels to take off during the day. It does utilize charge stored in batteries to power night time flight. It flies at a relatively slow speed of 28 mph to maximize energy efficiency. 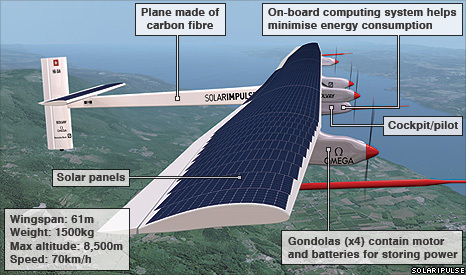 The design is intended to be able to fly for multiple days without stopping.